19,000 Brand Name Hotels have agreed to help schools raise money by offering lower rates than Expedia, hotels.com or the hotels pricing from 15% to 60% less. On average the deals are 25% to 33%. For more credibility if you need it, of the client is still asking if it is real. Gift and Save is a division of Destination Rewards who is the company that runs the rewards programs for Citi Bank, Comcast, Coke, Discover Card, State Farm and others. The software platform they use to run these rewards programs is the same one we use for the schools fundraisers. There is no way anyone could build the Hotel Savings Cash product to use as a school fundraiser as it sits on top of a 12.5 million dollar piece of software that takes 195 people to run the operation. Because big companies like Citi pay each month to use the rewards program we get to use the same platform as a fundraiser. As a final step if they want to see for themselves give a card or a PIN whatever you have. If you give them the PIN remember to give them the URL. There are no orders to take and deliver, the student has the card they sell the card collect the $20, give the donor the card the transaction is instant the donor pays the money and can access their Hotel Savings Cash instantly. Like with other programs where you have to take the order, then order the product then deliver the product the Hotel Savings Cash Card is one stop sale and delivery. The coordinator pays for the cards they sold and sends the unsold ones back for full credit. The amount of returned cards credited will be based on the same percentage of free cards the client received. As an example if the client buys 200 cards and received 50 free cards and then at the end of the campaign returns 40 unsold cards. They are credited with returning 30 paid cards and 10 free cards based on the same percentage they were sold and given the free cards and then sent a final invoice with the amount they owe less the credits. 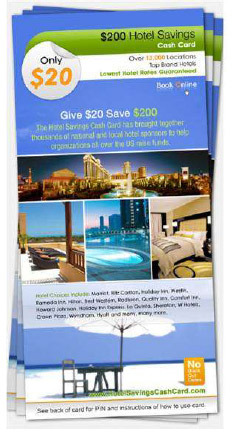 Does it Cost anything to Use Hotel Savings Cash Cards as a fundraiser? No, there is no set up fee and no cost to implement the program. Simply pick the number of cards you think you can sell and put a refundable $1.00 deposit on those cards. How much do we make selling the cards? The worst case is 55% of the gross and it goes as high as 72% of the gross. In either case, it is among the finest fundraiser programs available today. How long does it take to get the cards? Normally less than a week, at most 7 days. How many do we have to order? The minimum is 25 cards and you still get 5 free cards with that amount. Are the hotel deals real? Yes, you can compare to what the online sites like Expedia or the hotel itself will charge and because there was a donation involved the donors will pay on average 33% less than anywhere else. How is it possible to have all these deals on brand name hotels? Because our supplier is the leader in rewards programs and they created this opportunity for us with their hotel and resort partners. It is truly the greatest hotel deal anywhere. There are hundreds of card programs out there, why are you different? Most card programs work on 10% or less off. They advertise 50% savings but that is for one or two deals. Our average is 30% with up to 60% off and sometimes better than that. What if the cards don't sell? First, you are doing something wrong because they always sell. But, if you do not sell them return for complete refund of your deposit. What is the best way to sell the cards? Depending on who you are will make a difference on how to sell them. If you are a school or a sports league use your normal sales tool, the students, to sell them to the parents, friends, family and neighbors. If you are a church or charity send emails and flyers to your patrons to make sure they know what you have and how to get them and the cards can be sold at your actual fundraising event on site. Can donors re-buy online? Yes, once a donor has created an account there is always a redonate button on their information page. They can re-buy using a credit card and you receive the same amount as if you sold it yourself. We track where each donor came from and pay you at the end of every month for re-buys. There is a $1.00 processing and accounting fee. Are the savings instant? Yes, once the donor gives you $20 they get the card with a URL and PIN and go there to register their Savings Cash. They create a username and password and can login ASAP. They can book hotels instantly, so the savings are instant. What if they are not traveling anytime soon? They can use the Savings cash for much more than hotels such as rental cars, gift cards from retailers, thousands of products from jewelry to software, magazine subscriptions, entertainment venues, restaurant certificates, and so much more. Is the pricing on the other deals as good as hotels? Yes, and sometimes better, in some cases as much as 80% off and in some cases you only pay shipping and the item can be totally paid for using Savings Cash. What is the best feature of the Hotel Savings Cash program? The best part is you make a minimum of 55% of the sale and the donor gets 10 for 1 savings on their donation. How does it get any better. Can I get a sample card? 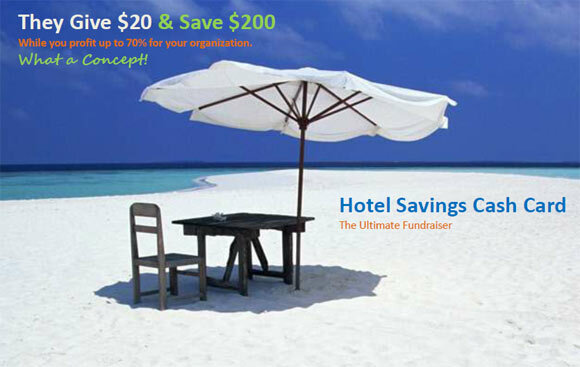 Yes if you are the coordinator of a fundraiser we will be happy to give you a free $20 / $200 Hotel Savings Cash so you can see the great deals we have to offer. A representative will be happy to walk you through the entire site. Ask your Rep.
How does the Hotel know how to use the Savings Cash? We have arrangements with all 19,000 plus hotels and have them on an easy to use web site. You find the hotel you want and pay the balance after using your Savings Cash right there online. You print the receipt and use it to check in just as if you booked at hotels.com or Expedia, only you paid less. What if there is a problem at check in? We have 24/7 customer service and the number is on the receipt for the hotel staff to call. So, you will never have a problem using this service.